Homemade cherry and chocolate glazed baked donuts sprinkled with sea salt. The same sweet taste as fried but less mess. Let’s just jump right into the donuts shall we? No introductions needed because a donut is just a donut, right? Actually all donuts are not created equal and as much as I love the flaky fried version, baked still make me feel good. Maybe it’s the fact that you only use a couple of bowls or that your kitchen isn’t drenched in grease spots, or clean up is a total cinch! We could debate forever my donut loving friends. Let’s just at least agree that most donuts are round. I recently made this Cherry Shortcake filled with a homemade style cherry pie filling. I had some extra cherry filling sitting in the fridge so I decided that it would probably be awesome mixed in to some donuts. I love it when an idea works out. Adding the cherry filling would probably have been enough, I could’ve walked away with my head held high, but I added chunks of chocolate too. Every good donut needs a glaze, that’s just a simple life fact. 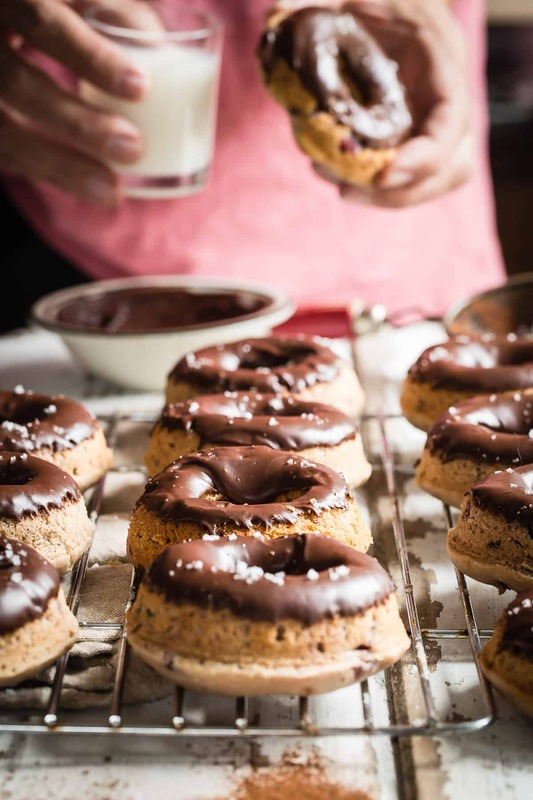 Powdered sugar mixed with cocoa powder milk and vanilla creates a thick sweet dip that sets well and embraces a sprinkle of crunchy sea salt on top. Every bite doesen’t guarantee a mouthful of cherries and gooey chocolate chunks, but stay with it because when you do get that bite, it’s so worth making these sinfully easy treats. Maybe you prefer lemon or maple pecan versions? Try these and let me know your favorites! Have a great week guys, I truly hope it’s better than the previous few we’ve had recently. 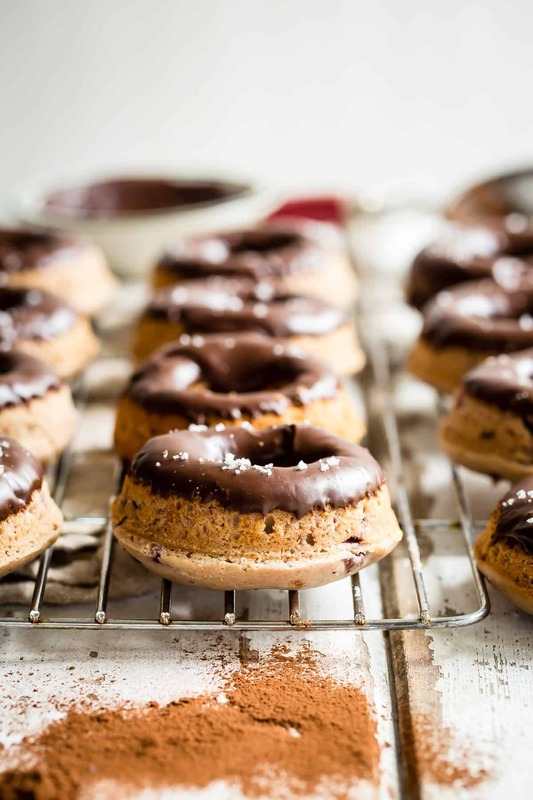 Homemade baked donuts packed with cherry and chocolate chunks and then dipped in a chocolate glaze. In a non stick pan melt the butter and add the cherries, brown sugar, cornstarch, apple juice and vanilla. Bring to a boil and then simmer for about 45-50 minutes until thickened. Let cool. Preheat the oven to 350 degrees F and spray a donut pan with a non stick spray or rub with melted butter to prevent sticking. Using a stand mixer beat the soft butter and the sugar until creamy. Add the eggs one at a time and beat until light and fluffy, scraping the bowl down each time. In a separate bowl whisk together the flour and baking powder. Gradually add the flour mixture to the creamed butter and mix on low speed. Add the vanilla and cherry filling, scraped the sides of the bowl with a spatula. Fold the chopped chocolate through the batter with the spatula. Spoon enough of the batter into each donut space in your pan until almost level with the top. Bake in the oven for about 12-15 minutes, let cool for a few minutes and then take the donuts out and let them cool on a wire rack. Repeat until all of the batter is gone. Sift the powdered sugar and cocoa powder together in a bowl. Add the milk and vanilla and beat well with a fork until the mixture is smooth. Warm the glaze in the microwave for about 8 seconds to loosen it up and then mix with the fork. It should fall slowly from the fork when scooped. 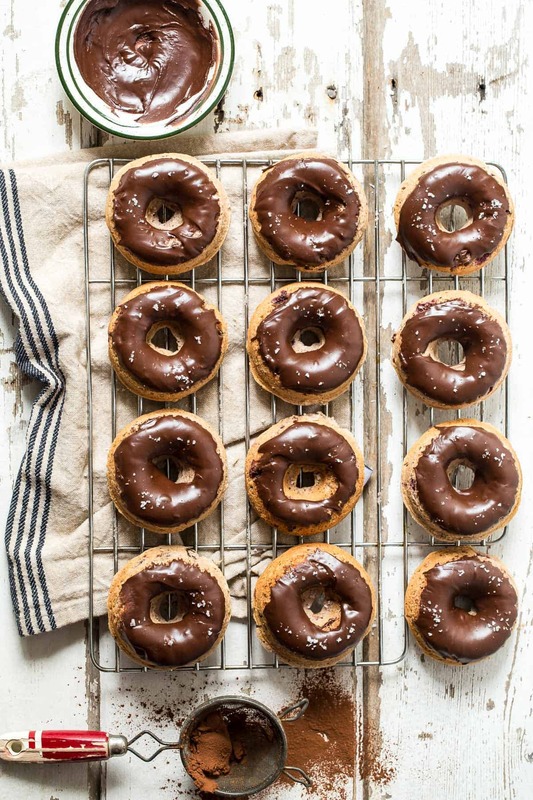 Dip each donut into the glaze and gently scrape the excess glaze off with your finger back into the bowl. Place the donuts back onto the rack and sprinkle lightly with some sea salt. Best eaten the day they are made. Those look so good Gerry, perfect flavor combo. Save me a couple! These doughnuts are on point! I don’t know what part I like more – the photos, the chocolate or the cherries!! Ahhh, these are out of control, Gerry! Thanks Alanna :) Have an awesome day! 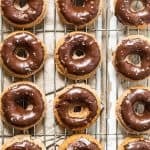 I love that salted chocolate glaze! These doughnuts look like a dream! I’d take a Baker’s Dozen and share? My kinda donut Gerry! 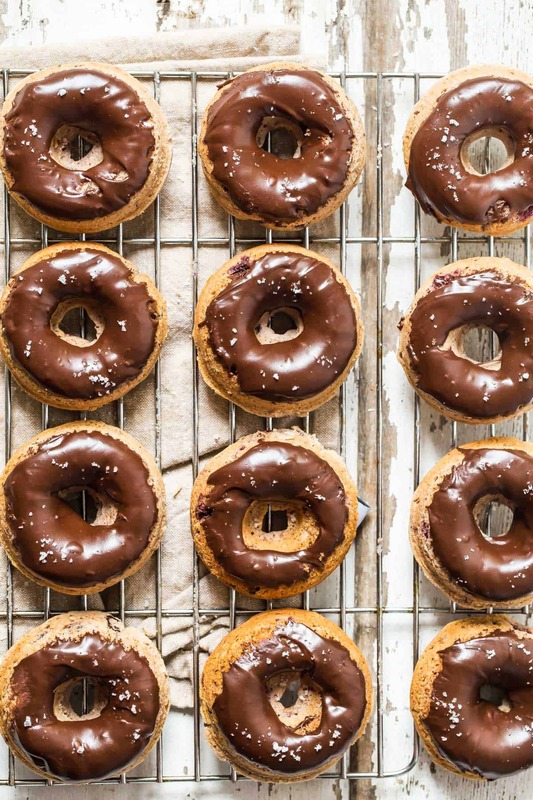 These look like donut perfection, Gerry!